Uncanny is opening for submissions on September 11, 2014. You can also find this information on our Submissions page. Please note that this is a temporary procedure until our new website and submissions system are completed. Uncanny is seeking passionate SF/F fiction and poetry from writers from every conceivable background. We want intricate, experimental stories and poems with with gorgeous prose, verve, and imagination that elicit strong emotions and challenge beliefs. Uncanny believes there’s still plenty of room in the genre for tales that make you feel. Uncanny is looking for original, unpublished speculative fiction stories between 750-7500 words. Payment is $.08 per word. 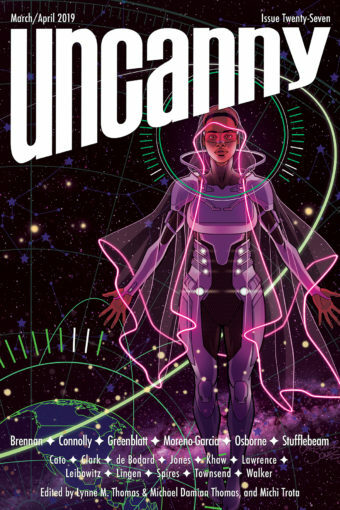 1- Please email your submission to uncannymagazine [at] gmail [dot] com. Make sure to put Fiction Submission: Short Story Title in the subject line. 5- We try to respond to all submissions in 15 days. Please feel free to query uncannymagazine [at] gmail [dot] com if we’ve had your submission for over 30 days. Uncanny is looking for original, unpublished speculative poetry of any length. Payment is $30 per poem. 1- Please email your submissions to uncannymagazine [at] gmail [dot] com. Make sure to put Poetry Submission: Poem Title in the subject line. This is wonderful! I’m glad to hear you are opening submissions and can’t wait to see this magazine published! If I may ask, how long will submissions be open? We don’t know how long we’ll be open. At least two months. Thank you very much, Ms Thomas! I appreciate the quick response.